The Ashokan Water­shed Stream Man­age­ment Pro­gram (AWSMP) thrives on the work and ded­i­ca­tion of our vol­un­teers. There are mul­ti­ple ways for you to get involved in AWSMP pro­gram­ming and help us achieve our mission. 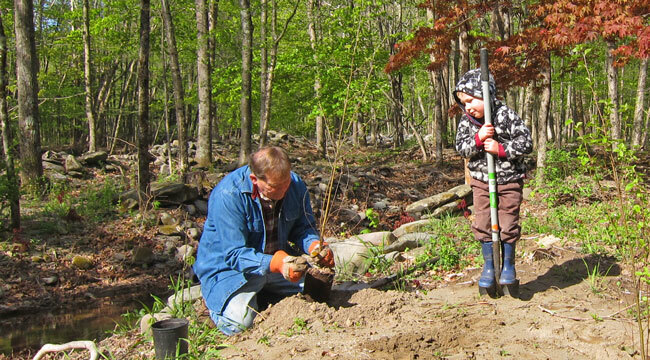 Stream­side plant­i­ngs help sta­bi­lize the stream banks. All ages are welcome! AWSMP has a num­ber of dif­fer­ent com­mit­tees and work­ing groups. All of the mem­bers who are involved in these groups vol­un­teer their time and exper­tise to help AWSMP accom­plish our mis­sion and our pro­gram objec­tives. Please visit Work­ing Groups and Com­mit­tees to learn more and con­tact us if you would like to be involved. These groups also help to develop vol­un­teer activ­i­ties. These events are pub­li­cized on our Face­book page and our News & Events listings. If you want to get involved, but don’t think you can make the com­mit­ment to that serv­ing on a work­ing group requires, you might like to join a one-day vol­un­teer event. There are stream­side buffer plant­i­ngs, stream clean-ups, teach-a-child-to-fish days, fairs and fes­ti­vals, and other assorted events that we could use help with. The events that need short vol­un­teer involve­ment will be posted in our News & Events listings. Cor­nell Coop­er­a­tive Exten­sion is an employer and edu­ca­tor rec­og­nized for valu­ing AA/EEO, Pro­tected Vet­er­ans, and Indi­vid­u­als with Dis­abil­i­ties and pro­vides equal pro­gram and employ­ment opportunities.